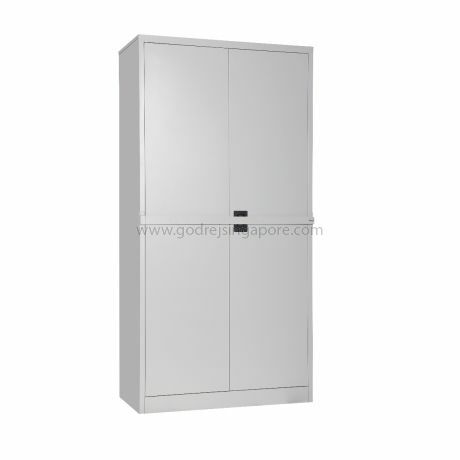 For added security Godrej provides a 6mm thick security bar(which covers the cabinet lock) which is anchored to the cabinet by welded brackets and has provision for users own pad lock. All our Swing Door Metal Cabinets undergo automatic powder coating with epoxy polyester powder in seal grey colour of 40-50 micron thickness and are also phosphatized against rust to provide a finish to the Metal Cabinet that is suitable to the interior design and decor of Contemporary or Modern commercial and home offices. All doors of our Storage Steel Cabinets have heavy duty full length stiffeners to provide greater rigidity. Our FULL HEIGHT SWING DOOR METAL CABINET comes with 3 adjustable shelves. Extra shelves can be purchased separately.